Let's talk about comfort food!!! I hope everyone is having a nice weekend! Mine is more or less relaxed for now. 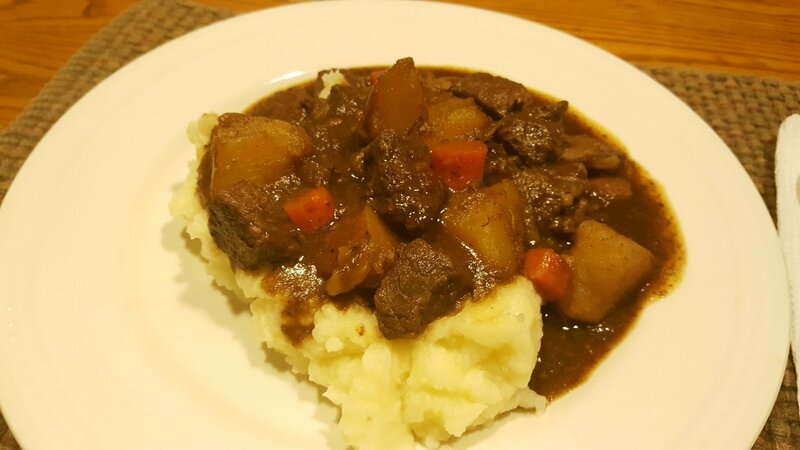 :) Last night to celebrate St-Patrick's Day, I made a Guinness Irish Stew on a bed of mashed potatoes. Delicious! Kunde Estates California Zinfandel 2012. When Alex and I met, we had a good combined income and we invested in a dozen or so good wines to age. We decided to open one up on our anniversary...this is the smoothest, fruitiest Zinfandel I've ever tasted! I have to get my hands on another one to age another 5 years!! Hope that got your appetite going! Speaking of appetites, we are CRAVING salads....since we can't digest store-bought lettuces, we have to rely on our own. 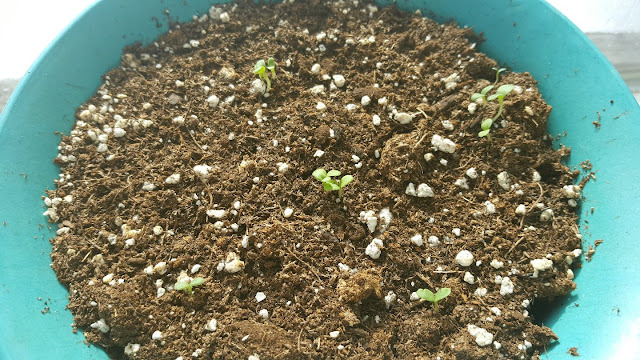 I planted 4 containers of lettuce a week ago and looky here! The flowers I planted are all doing well, except the Marigolds that never sprouted at all! I'm posting this to share my ideas. If you are the chef in the home, you know sometimes how challenging it is to come up with meal ideas! This is what I'm working on today. I'm checking the flyers to see what's on sale, then I'm going to come up with meal ideas based on the themes. I have to plan each meal according to the ingredient. The fresher ingredients will get eaten first. I don't mind heading to the local grocery store in a few weeks to pick up more fresh veggies and milk. Hello, dear Rain - Papa Pea would have slurped up that Irish Stew over mashed potatoes in a second. Just the kind of meal he loves. 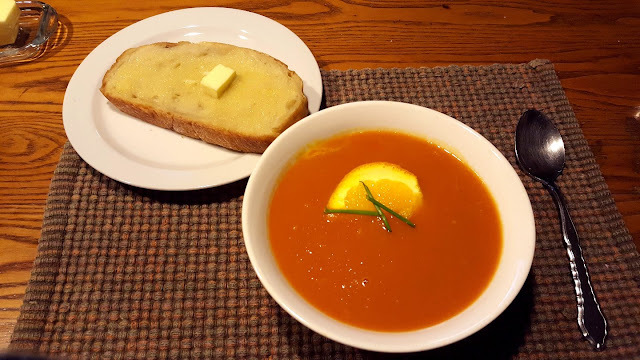 I made a carrot soup just once, but neither of us were crazy about it. We'd rather have our carrots raw! I know what you mean about craving fresh salads. Lucky for us, our organic co-op has had the most wonderful fresh spinach lately. We've just about been inhaling it. Your window garden is doing so well. You'll be far ahead of me in having green thingies to plant outside this spring. I've not started anything inside yet. Still a smidge early for us here. We're having an organizational weekend. Have got a busy week coming up so want to be ready for it. Just got in two big wheelbarrow loads of wood as we're still having a fire first thing in the morning and last thing at night. Lots of sunshine recently so we don't need anything going during the day. Yes, spring really is coming! Hello again, Rain! I've been craving fresh produce as well and bought loads of broccoli and romaine lettuce on my monthly Costco shop. Today is gloomy and the ground is a mix of snow, ice and muck so I'm staying inside and finishing the next chapter of my story. beautiful and delicious post!! Your plants are doing beautifully too!!! Mmm, everything you make looks delicious. I haven't made Guinness stew for ages. I used to use a recipe for the slow cooker I think. We had corned beef W,Th. Costco sells them and I like how I can either use my slow cooker, the stove top, or the oven. I bought another Friday. I should buy more b/c I'm craving corned beef hash! You have really gotten a nice little herb garden going. What kind of lettuce do you plant? All the citrus trees are blooming here. The air is thick with their sweet perfume. I didn't know bottle wine could continue to age once it was bottled. I learned something new! I don't think I could do menus for a whole month, I manage to do 2 weeks at a time but only shop for 1 week at a time. Most of my shopping is fresh produce and it doesn't keep for more than a week usually. Rain, if you are ever in the market for the best of Zinfandels, get an Old Vine. These are from the Head Trained Vines, not the modern trellised vines. They are amazing. (And The Ravishing Mrs. TB would have loved the Zin. We are great wine fans and consumers here at Ichiryo Gusoku. Congratulations on the Lemon Tree Revival! 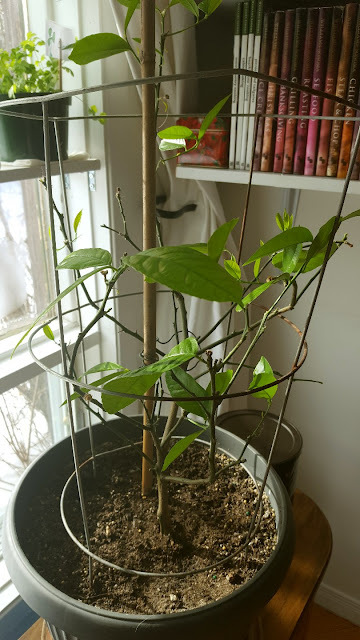 My did not make it through the winter this year; I am wondering if I should just covert to Mandarin Oranges and try again (supposedly the heartiest of the citrus). everything looks delicious - especially that stew. I enjoyed reading your post. Nothing beats a good stew to warm you through, we have another bout of unseasonable cold weather and snow I have delayed lots of seeds and planting but things will catch up. I wish to come live with you....your food looks amazing and I know I would eat well! Haha....and I bet we could have some awesome conversations! But....on second thought, I would probably gain my 70lbs back. Have a great day Rain. Hi Rain, i’ve set myself the challenge of eating absolutely everything I used to turn my nose up at. Out go the burgers, chips and fancy foods and in come the very basic stuff like mash. I’ve seen some photos of vegetarian stews and have thought yummy when do I start. Vegetarian food can be spicy if you want it to be. I’ll eat a raw swede if that’s on offer. Last night I tried to eat a banana with the skin still on.Today is the 57th i’ve gone without sugar. Maybe it’s making me mad. But when you lay awake in bed at night salivating over vegetable stew, you know something is wrong. YOur stew looks good and I find liquid soups to not be very filling. It sounded good though and that bread looks yummy. I made corned beef and cabbage and lots of root veggies to keep me grounded! I'll be eating it all week. It's raining here today and tomorrow so I'll be doing some cooking and cleaning and then outdoors on the nice days for at least 3 tasks outdoors. I'm hoping to get back to deep cleaning today. 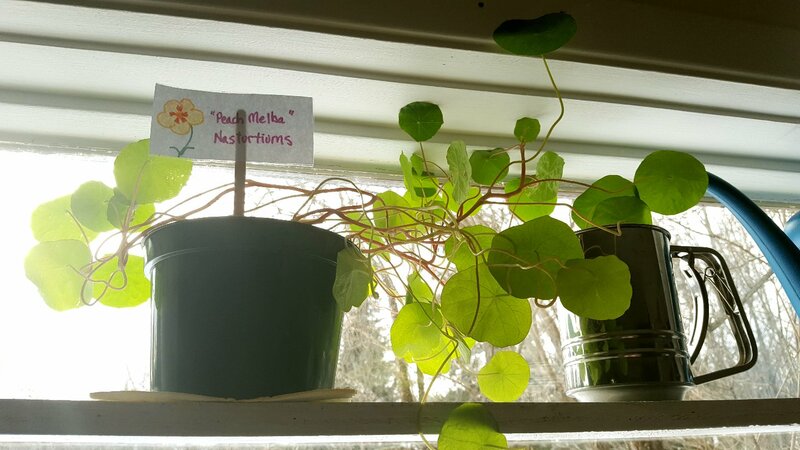 Your green thumb is amazing even bringing plants back to life! You're "the plant whisperer"! I love your themed meals and menu. I may have to plan a few of those. Although I do that on Holidays. My biggest issue is planning healthy snacks that I enjoy. I love cheese but need to not eat too much of it or dairy which is really hard for me. I did like the bean dip I made but I need more than that! LOL! Loved the picture of you and Alex....you are both photogenic! I'm off to get busy now that I got my dose of Rain Inspiration! Glad you are back! I think that menu idea is super! I tried to do it myself but, with only me, I am not inspired to cook every night. I have pared it down to cooking on Sunday for the whole week. Granted, by Thursday I could die of boredom, but at least I don't have to think about what I'm going to eat. Zinfandel is one of my favorites - I have not heard of this one and will have to do some research. I know I should be starting some seeds, but, with all that white still out there, I just don't have it in me yet. It's so good to see you back, Rain. Your food looks delicious and your plants wonderful. I made some Irish Soda Bread for St. Patrick's day and I thought of you when I took a picture of it. :) You have been missed! The food looks delicious like always. 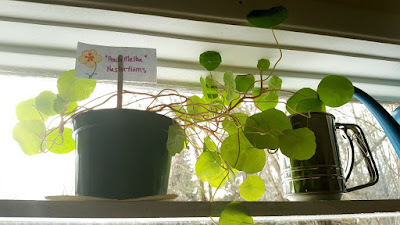 All your plants are conibg up so nicely.makes me even more anxious for garden season :) we are enjoyjng the warmer weayher and sunshine these days :) have a happy shopping day !!! Hey Rain, I have to tell you that I am going to have to make that stew! Even now that I'm not hungry, I am tempted by it. It looks like such a great meal. I've saved the recipe and will have to cook it at some point when I have all the ingredients for it. I totally get it about the cheese. It is almost becoming a luxury with how expensive it is. It isn't something we have regularly. That Mexican fiesta sounds like fun! And so tasty. 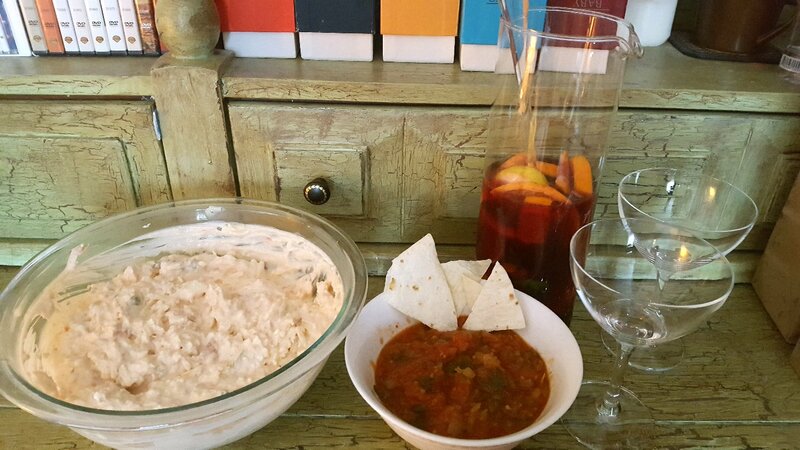 I'll have to check all the recipes you've shared, particularly that homemade salsa. That is something I'd really enjoy! And your plants! How wonderful. You are getting an early start to spring! Hope you're doing well and your week is off to a great start. Hi Mama Pea :) The stew was delicious! I'm not a beef eater because I can't digest it well, but I had it without the meat chunks and loved every bite! :) I haven't had good luck with carrot dishes, except the carrot cake. It was nice for one meal, I don't think I'll make the soup again though! Everything I planted in the window stays indoors until May. 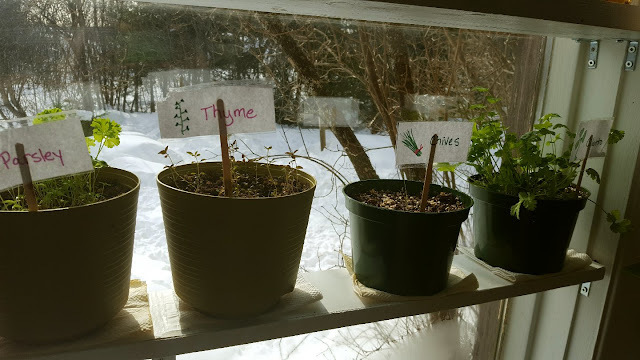 The herbs and flowers are okay in the window, but once the lettuce grows, I need to put it in a bigger pot and somehow barricade it from the cats! I have to think about that one! I don't think I'll start my summer seedlings for another month though. Hi Tpals :) I have to catch up with your writing!! It's been an insane month which is odd because usually I am not very busy in the winter. I can't wait to eat some fresh lettuce...I'm encouraging my little lettuce seedlings to grow fast lol! Hi Laurie :) Thanks :) We do celebrate every month, before it was fondues...now it'll just be a nice dessert. Gotta save all of my pennies!! Hi Stefanie :) Corned beef hash!! I haven't had that in a very long time. A friend's dad in high school used to make it, it was so good! Now I'm craving it lol! Hi TB :) Where I live, here in Quebec, they stock what seems to be 90% French wines, I'm not a fan of French wines. Some Bordeaux are really nice and rich, but overall I find them tangy and vinegary...maybe it's just the ones in my price range. For the California/Australia/Italian and Chilean reds that I adore, I mostly have to drive to Ontario to get. It's about a 2-hour trip each way. Alex and I used to do the trip once a year, but since we're tightening the belt, we'll have to find what we can here. I've read about the Old Vine Zins, that originally came from the Italian Primitivo grape, another of my faves! I thought my lemon tree was dead too, but a little doting really worked miracles! I think I had it too close to the baseboard heater too. Hi RO :) Thanks :) I'm really so happy about the plants, though scratching my head as to why the Marigold flowers didn't even budget out of the soil! New seeds too. Hi Sam :) The thicker the stew, the better for me! The stew was really good, but the carrot soup was just so so. Ha ha ha...the plant whisperer...I do talk to my little seedlings, that's for sure lol! :) As I've said before though, it's the soil and the sunny window that makes all the difference! I wish I had more sunny windows, I'd have a hundred plants growing! :) I'm so glad I inspired you, good luck with your deep cleaning, it's not fun! Hi Susan :) I know how you feel, before I met Alex, I was actually alone for nearly 20 years! I didn't have inspiration to make big meals for myself...it was usually the same rotation each week. But I guess it's fun for me now that someone can enjoy the food with me. I tried to stick to the themes this month, for the most part I did, but I saw that fish and a certain cut of beef that Alex loves was on sale, so we're having more fish/meat nights. Isn't the Zinfandel awesome??? You should try some Italian Primitivo, that's where the Zin vines came from originally. I know what you mean about the white stuff out there...but those green plants are making me so happy right now, knowing we won't see the grass for another few months! Hi Becki :) Oh thank you, that's sweet to say! :) I have never made Irish soda bread...I've eaten it though. I will have to look up a recipe for next year, thanks for the suggestion! Hi Martha :) I think you NEED to make that stew lol...and on a plate of mashed potatoes...it's heavenly, very potato-heavy but that's okay. :) Now that the roads are mostly snow and ice-free, I did the shopping back in St-Sauveur where my cheese shop is located. I FINALLY got some good cheeses there at reasonable prices, but we're cutting down a lot on the cheese meals. It's crazy how the prices go up, yet the packages weigh less and the quality is like cardboard. Even our standard Cracker Barrel cheeses aren't as good as they used to be. I have to try making my own again soon, I was just so discouraged by the failures...but I'll go at it again once I have some more time! I have the ingredients, just the milk needs to be bought. Rain, you are brilliant! You are an amazing chef! Does your hubby cook too? Happy the wine was so good! 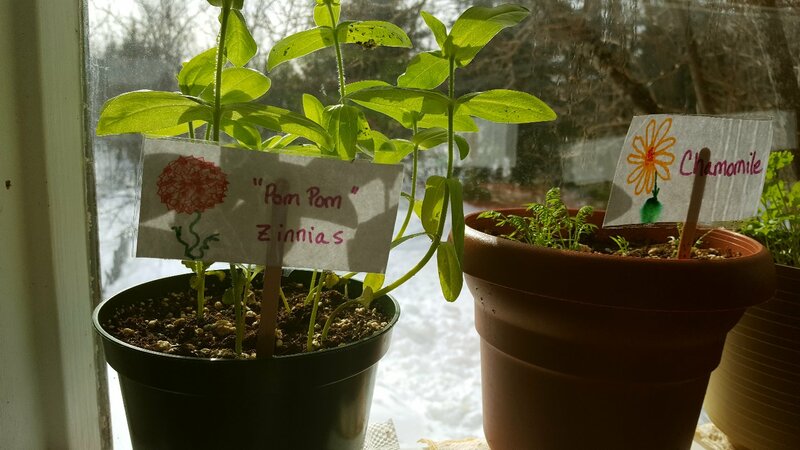 Congrats on your herbs, lettuce and lemons! Everything is growing amazingly! Big Hugs and thanks for the recipes! Thanks Nancy :) I love being in the kitchen! I need a bigger one lol...I'm so sorry about your health problems, I hope you're okay. The window garden is a surprise this time of year because it can get really cold overnight by that window. The green is much needed though! How did I miss this post??????????????????????????????? We do not plan meals, really plan. He is the chef, and he picks meat/chicken/fist. Organic when possible. Just 2 of us, we can do this. We always say we are going to plan. And we always give up. -sigh- One of those things, which we really, really, really need to get ourselves in gear, and doooooo! I hate grocery shopping!!!!!!!! Hi Wisps of Words :) Lol @ "fist"...I was wondering what cut of meat that was ;)! Since we have a strict food budget, I have to plan things out as much as I can because we LOVE to eat. Dinner is our favourite time of the day. I tried once to just buy a bunch of stuff and fly by the seat of my pants but it caused me way too much anxiety! Ugh...grocery shopping, I just hate shopping in general, being around people...I feel all of their negativity and it's not a pleasant experience! Oh I LOVE a good Irish stew and have not had one in years!